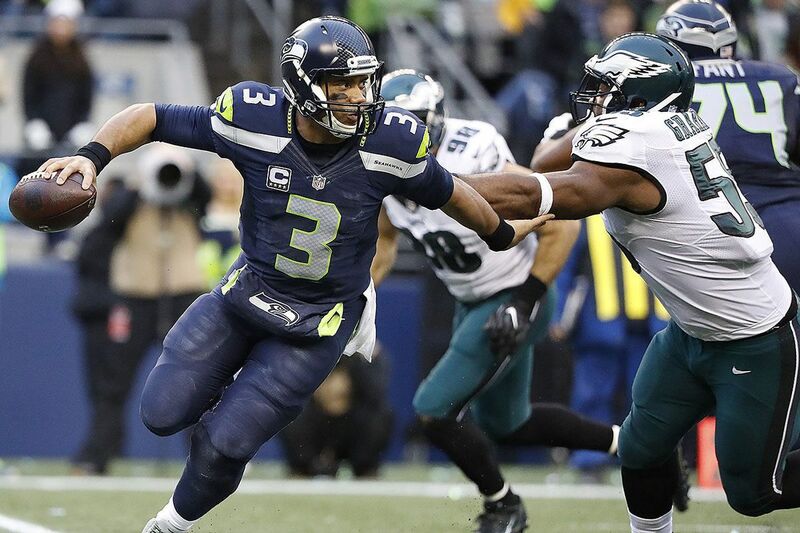 Seahawks quarterback Russell Wilson scrambles away from the Eagles’ Brandon Graham. The Eagles started preparing for the Seattle Seahawks on Tuesday, and the defensive players did not need any clues about where to focus their attention. "Russell Wilson, hands down," linebacker Nigel Bradham said, referring to the Seahawks quarterback. "His ability to make plays and extend plays is unbelievable. You see some plays on film where he's completely running backwards just creating time and running away from guys. It's definitely him. That's the first thing you notice." The quarterback is often the central figure for a defense's preparation, but it's more significant against Wilson and the Seahawks. Wilson doesn't just lead the Seahawks' seventh-ranked passing offense with a 62.3 percent completion percentage and 3,029 yards, 23 touchdowns, and eight interceptions; he's also their leading rusher by a significant margin, with his 401 rushing yards nearly 200 yards more than their No. 2 rusher. If the Seahawks upset the Eagles on Sunday, it'll likely be because of Wilson. The Eagles have had success this season making teams one-dimensional. They bottle up the running game and send their pass rushers after the quarterback. But that could play into Wilson's strength. He might be the best quarterback the Eagles face this season, and his acrobatic ability to escape pressure sometimes counteracts a pass rush. Defensive coordinator Jim Schwartz suggested that Wilson leading the team in rushing doesn't mean they lack a running game. He said because the Seahawks use multiple running backs, their combined production shows that the Seahawks can run. But the six running backs they've used this season have combined for 215 carries and 694 yards – 3.2 yards per carry. Take away the production of rookie Chris Carson, who's been on injured reserve since Week 4, and the running backs average 2.9 yards per carry. This is not the Marshawn Lynch-fueled offenses of past years. It's Wilson's show, through the air and the ground. "Seattle has transitioned a little bit," Schwartz said. "Now they're one of the top passing attacks in the NFL. They've got good receivers. They've got a great tight end, and they've got a quarterback that can throw it on time, but then he can also create something off schedule." Wilson, who is in his sixth NFL season, has increased his passing yardage every year in the NFL and topped 4,000 yards the last two years. He's on pace for his best season yet. The Seahawks have accomplished targets around him, including Pro Bowlers Doug Baldwin (58 catches, 698 yards, four touchdowns) and Jimmy Graham (49 catches, 447 yards, eight touchdowns). Paul Richardson and Tyler Lockett are also key contributors. All four have played at least three seasons with Wilson, which helps their chemistry. "They're more so relying on their quarterback," Bradham said when asked how the Seahawks are different this year. "We pretty much got to be ready in the pass game, be able to take away some of their key receivers – Lockett, Baldwin, and obviously Graham." The mobility takes it to another level. The Eagles faced Panthers quarterback Cam Newton this season, and Chiefs quarterback Alex Smith is also one of the most mobile quarterbacks in the NFL. But Schwartz said Wilson is "unique in his own ways" and compared him to Hall of Famer Fran Tarkenton. The backward running that Bradham referenced is what Schwartz thinks makes Wilson most dangerous. "He can run the designed quarterback runs, the zone reads, the keepers and things like that. And then he can also just create something off schedule," Schwartz said, "But he can threaten inside the pocket. He can threaten outside the pocket. But probably the thing he's most dangerous in is threatening by running backwards because it's easy to keep contain. Well, it's not easy, but you can keep contain and you can prevent step-ups, but it's hard to get somebody directly behind the quarterback. And that's where he can just turn and run and escape, and then once he does, he can create some problems for your defense." It's not about simply using a "spy" on Wilson, which Bradham said teams have attempted. Schwartz's message to defensive linemen is to remain on their feet and stay alive in the play, because even when Wilson scrambles one way, "there's a good chance he's coming back to you." The Eagles must hold their coverage; wide receivers such as Baldwin are conditioned to keep running while Wilson buys time, and they've made big plays while he improvises. The Seahawks have lost key players from their Super Bowl teams in other areas, but Wilson has been a constant. He is the biggest impediment to the Eagles winning their 10th straight game. "A lot more focus goes to him [than] the run game itself," Bradham said. "Because he does everything."